Post Your Brick Walls ~ It May Lead To The Best Birthday Present Ever! September is the month of my birthday. One year ago, I celebrated my birthday in Sweden with cousins I met for the very first time! Five years ago, I didn't even know they existed. But now, I have had the best birthday present ever! One of my Swedish cousins found me through this blog about 4 years ago. It is true, blogs are cousin bait! My cousin saw a post I did April 2, 2009. It was Sept 20, 2010 when he found my post. Yes, almost a year and a half since I wrote it. Does that matter? Not all all, he found it and I am forever grateful. He left a comment saying he thought he could help answer questions on my Lundberg family in Sweden. 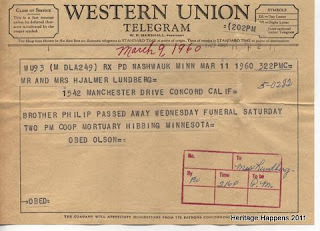 When I finished reading his comment, I was stunned as his last name was Lundberg! "Use your blog to break down a brick wall. Posting may ring a bell with a reader. Maybe you will make a connection in five minutes. Maybe it will take two years. Either way, asking for help is the first step to nocking down that wall." I would like to remind you, post about those brick walls! My cousin, Jan Lundberg, wasn't into genealogy as much as I was. In other words, he didn't have a tree with names on it. He had interest however, because he was googling family names when my blog post popped up. We were so excited for our connection. I don't think I could tell you who was more excited, Jan was most definitely as excited as I was! Last year I was fortunate enough to go meet my family in Sweden. Yes, I had my "Great Swedish Adventure," but not through the television show. I believe my adventure was even better. Here we are, the Lundberg Family in Sweden! Jan, who found my blog, is in the second row, second person from the left. His dad Rune, has his hand on my shoulder. Rune's brother is on his left, Kjell. Kjell and his wife (not in the photo) were very kind and let us stay at their house. Rune and Kjell are my third cousins and do not speak English. I had big plans and studied Swedish before the trip, it wasn't enough. Studying was interrupted when my husband had a heart attack. We were fortunate though, some of my family members could speak a bit of English, so we were able to communicate actually quite well. I plan to get back to studying Swedish, I want to be able to speak to my third cousins the next time I go to Sweden! I am using Rosetta Stone and I absolutely LOVE the program. I also have the full Rosetta Stone set for Spanish as well, so I better get at it, I am determined to communicate with family members in Costa Rica as well. Make sure to post about your brick walls and questions you have. You never know, you may be traveling one day to another country for your birthday to meet new family! Yes, Cheryl, you are rigth! One can post about the brickwalls in your blog and maybe someone else can see it and recognize something. I myself have done so. I posted a photo of a wedding couple where I only had the name, and that it was from Chicago. A few years later, a relative found it, it was her grandparents ...! I am so happy for you Yvonne, finding answers is FANTASTIC! Better yet, finding relatives is the bomb! I have been so busy I haven't been able to study yet. My house is being updated and wow, do I have a mess. Thanks Yvonne, Kram!